Genesis 1-25 takes its readers on a hundreds of years journey from the beginning of time up to Esau selling his birth right to his younger brother Jacob for a bowl of stew. As I read through the first 25 chapters of Genesis, something I’ll admit to not have done consecutively for quite a long time, I was mainly taken aback by the, not one but two, accounts of creation. It’s a great puzzle to me what the point is to having two similar but different accounts. Why are they both there? Is it a fluke? An accident? or every bit intentional? This is something that has always puzzled me. Creation is a serious topic to mankind; in fact I’d even venture to say that it’s the topic of mankind. Man is always working to answer the questions: Where’d we all come from? What is our purpose? How’d we get here? Science has been advancing since the beginning of time trying to uncover these answers. Theologians have studied scripts and thought trying to reason their way into the answers. Religions have created stories to fulfill these answers. Mankind is striving to figure out what happened that brought us to where we are now. So what’s with the two different accounts of creation in the Old Testament? The previous assumption, and the assumption that Genesis 1 and 2 were written by the same author, which I have heard no argument that has yet convinced me they weren’t, leads me to think that it was not a fluke that Genesis 1 and 2 are chronologically not in sync. After all, it’s highly unlikely that the author would write Genesis 1 and then just accidentally get the order flipped around in Genesis 2. In the simplest of revisions, he would have noticed his mistake and corrected the sequence. But then why? Marc Brettler in his interview on NPR about How to read the Jewish Bible stated that the first account of creation seemed pristine, perfect, and therefore unbelievable, but that the second account was more like the world he knew – a world of trial and error. Can this literary technique in Jackson’s article coincide with Brettler’s opinion that the second account is more realistic? If the second is more realistic isn’t it much more likely that its events were written with chronological intent, making the first some type of literary device? I remember discussing this chapter with a woman, Sarah Parham, who is studying at Asbury Theological Seminary the last time I read Genesis, and had questions about the two accounts. Her opinion seems to make the most since to me of everything else I have heard thus far. 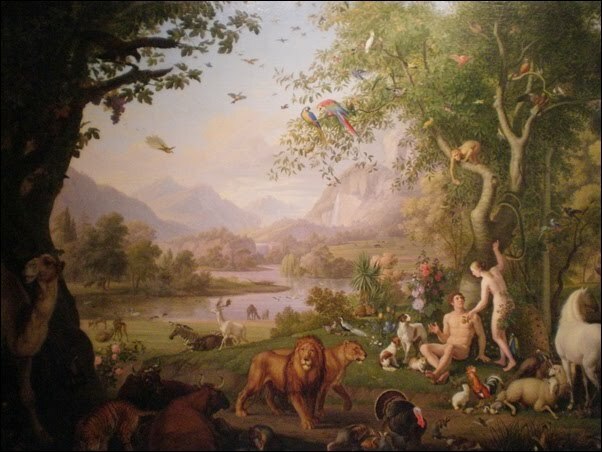 She would agree with Jackson that Genesis 1 is some literary device, and she would agree with Brettler’s claim that the 2nd account seems more like earth we know now and is a more believable creation story. Parham see’s the first chapter of Genesis 1 to be a literary device that is equivalent to the opening narrator to a theatrical production. She says that the style of the writing by the repetitious and the, almost, poetic flow creates this sensation of a grand narration to a fantastic story. Chapter 2 then would be the opening scene, not Chapter 1. This analysis has been the best explanation I have found for the literary discrepancies between the chapters 1 and 2 of Genesis, and I am extremely curious to learn more about these first two chapters. As for the rest of Genesis, it was not as intriguing as the first to chapters for me, but it still contains its own peculiarity. Something else I would like to discuss in class is the style of the stories in the Old Testament and the purpose of the genealogy explanations between almost every story. These genealogies appear to be a break time; the end of one story and a segue into another. I’d like to know the purpose of this. Is it just a popular literary technique at the time, or is it culture, or is there a point to it in the stories? While reading through the chapters of Genesis, I also realized that some of the ages appear a little inconsistent with time. Specifically in chapter 17 Abraham circumcises himself and his son Ishmael who was 13. However in chapter 21 Ishmael is only a baby when Hagar left him to die under a bush. I know that the author of Genesis is at best speculated but I wondered about the disjoint chronologically between chapters, and if this inconsistency insinuates that Genesis has multiple authors? This entry was posted in Miscellaneous Discussion and tagged Apologeticspress.org, creation, Genesis, Literature and Creation, Marc Brettler. Bookmark the permalink. 1 Response to Creation then… Creation Again? Wow…a great article here that anticipates a lot of what we’ll be talking about during the next week or so. As we’ll come to find out from reading Genesis and Marc Brettler, there are in fact two distinct creation accounts that have been redacted together by later editors. Each account not only answers the questions of “who are we and how did we get here,” but are also distinct theologies. That is, they describe unique understandings of who God is, what he creates, and how he creates it, and what it all means. I like how you put the article from Apologetics press in contest with Bretter. It’s clear that the Apologetics website has a clear goal to propagate Christianity. Hence the very strange interpretation of the 2 accounts. More to follow in class!